Water surface level with the surroundings: a unique visual effect. Overflow and infinity deck level pools are the ultimate in decadent luxury, but as well as being a particularly attractive design of outdoor swimming pools, overflow and infinity pools are also a lot more efficient from a maintenance perspective. Does the thought of clearing dead leaves and insects from the surface of your swimming pool put you off the idea of having a pool installed? With a Compass Pools innovative overflow and infinity deck swimming pool design this is not an issue you need to be concerned about. The overflow system is manufactured from the highest-quality 301 stainless steel, for years of hassle-free service. There is also an option for 316L Stainless for salt water applications. Infinity pools are a design trend in the 21st century for their beauty and pure elegance. The infinity pool however is often confused with the overflow pool or deck level pool so we are here to explain the differences in their design and construction, and what makes one infinity pool stand out from the rest. An infinity pool gets its name for the seamless blend between the edge of the pool and its surroundings – usually another body of water like a sea or lake – that make it appear as if the pool continues indefinitely. For this reason, a true infinity pool, or negative edge pool, has to be built on sloped ground, where at least one side can look completely edgeless. To achieve this illusion, the water level along the “infinite” sides flows over the edge of the pool, into a weir or secondary pool. An infinity pool should not be confused with a deck level pool or overflow pool, where the water’s edge meets the same level as the deck and flows into a visible grate around the perimeter. As described above, the location of the infinity pool is the first design consideration. Surrounding levels and sight lines must be carefully considered to achieve the infinite-edge look, merging with the secondary body of water. Once the sight lines and position has been determined, the materials are the next decision. For maximum effect, the colour of an infinity pool should be closely matched to the body of water, sky or landscape it will be blending into. Infinity pools are more technically complex than a standard pool, for two reasons. Installing a pool on a hillside or slope is not only more logistically complex, but poses different strains on the pool from an engineering perspective that must be considered in the designs. The overflow edges that would normally have the surrounding ground supporting them will need to have a wall structure, similar to a dam. The edges utilising the overflow effect will need to be constructed to the same tolerances of a deck level pool (approximately 1-2mm along their length). Without this careful calculation, the water will not flow evenly. There also needs to be a complex system of balance tanks and pumps to ensure that the overflow remains constant, regardless of how many people are in the water. A Compass pool is a unibody lightweight structure, made of carbon ceramic and installed in one piece by crane. Its lightweight Swimming Pool Construction material overcomes many of the structural issues involved with building a concrete infinity pool, such as the flexibility of the material accommodating for light movement in the ground. The close tolerances in the pool level are achieved with an adjustable stainless steel edge, making it extremely accurate and quick to install. Water level is maintained using VSD (variable speed pumps) and a computer-controlled water level system, to not only achieve the correct water level but to save on running costs. How much does an infinity edge pool cost to run? Infinity pools will naturally cost more to run than a conventional freeboard pool, as there is a cooling effect on water flowing over the pool edge. This is greatest when the outside ambient temperature is low, as with the beginning and end of the swimming season in the UK. The cooling effect can be eliminated using Compass Pools’ variable water level system (VWLS). The system is linked to the automatic safety cover, so when the cover is open and the pool is in use the water level raises up to overflow the infinity edge into the weir. When the pool is not in use, the water is pulled from a twin safety main drain, as per a conventional pool, giving you the best of both worlds. Without this system you will be looking at additional running costs in both the heating of the water and the running of the overflow system. The exact number is calculated by a multitude of factors, including, but not limited to: air temperature, wind speed, site exposure, soil type and water content, pool temperature and hours of use; making for a difficult calculation. How much does an infinity pool cost to install? Naturally, beautiful things are never cheap and unfortunately the same applies for an infinity pool. Due to the complex design, infinity pool installation should only be completed by a qualified professional installer, and is not something that should be attempted by a self-builder or first time contractor. In terms of price, an infinity pool will typically add a minimum of £30000 over a similar sized conventional free board or skimmer pool. This price is however variable based on the site conditions and access. Compass Pools have been involved worldwide in some of the most technically challenging infinity pool installs, from helicopter lifts to complete pools being suspended in mid-air with steel work. Compass infinity and overflow pools are a masterpiece of form and function. The water in a regular swimming pool normally sits well below the perimeter of the coping stone pool surround. In an overflow and infinity deck pool the water sits at a much higher level. The innovative design of our infinity and overflow system uses the same engineering found in public and competition pools. Water is drawn uniformly off all areas of the swimming pool’s water surface, which ensures all particles and floating debris are removed from the water before it passes through your pool’s filtration system. Not only does a build-up of debris look extremely unsightly, but it also clogs up your filter. Scientific studies have consistently proven that this type of system is far more efficient at maintaining water movement over the surface of a pool, which is where most debris (such as leaves, dead insects and other small particles) collect. The end result is a sparkling, perfectly clean pool with no dead spots and floating debris. Traditional methods of dealing with surface debris include skimmers and drains mounted on the interior walls of a pool. A Compass Overflow system removes the necessity for a skimmer or wall-mounted drain, as the water surface is raised to the same level as the surrounding patio or decking area, which gives you a more aesthetically-pleasing visual effect. For the ultimate in opulence, Compass Pools can provide you with a deck level swimming pool where the water flows in all four directions simultaneously. Or, if your pool is installed on the side of a slope, you can enjoy a magnificent infinity effect swimming pool whereby the water flows over one edge, exactly as you might see in a luxury hotel resort. 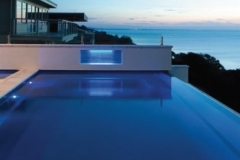 All Compass Pools infinity and overflow swimming pool systems are manufactured from high grade 301 stainless steel. This ensures corrosion is not a problem during the normal lifetime of the pool and you can enjoy years of hassle free service. For salt water swimming pool applications, there is also a 316L stainless steel option available for extra protection against the corrosive effects of salt water. 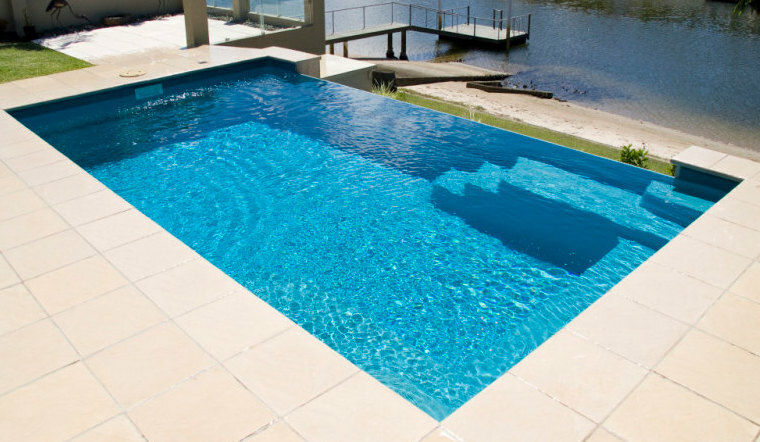 For more information about Compass Pools infinity and overflow pool systems, and how they can make your life a lot easier, give us a call today.